Page added in May 2015. You may wish to see an introduction to this section first. 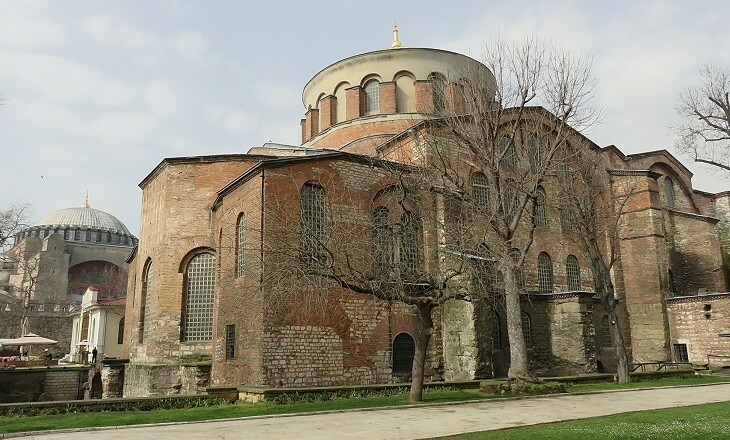 Hagia Irene is the oldest church of Constantinople as it is believed to have been built on the site of a temple to Aphrodite prior to Emperor Constantine's decision in 330 to move the capital of the Roman Empire to Byzantium. Similar to Hagia Sophia it was not dedicated to a saint, but to a concept because Eirene, according to Hesiod and other Greek writers, was a personification of Peace. 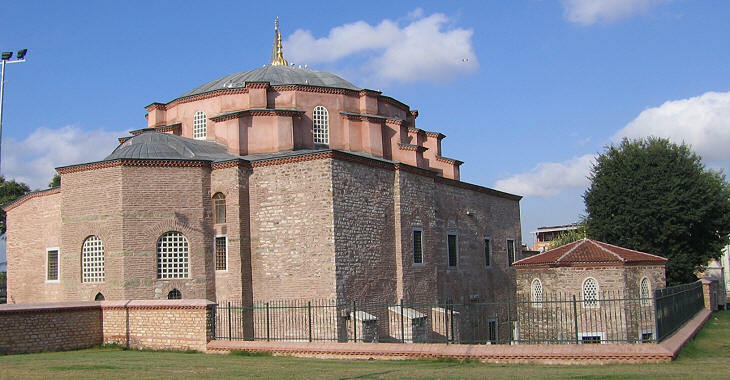 In 381 it housed the First Council of Constantinople. 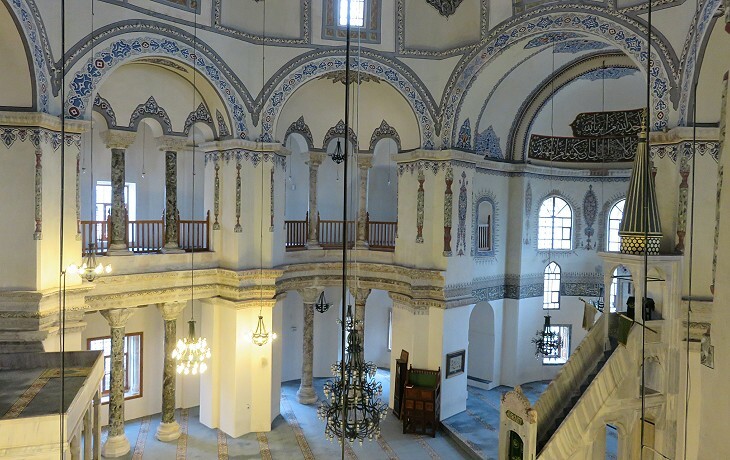 The current building however is the result of a reconstruction ordered by Emperor Justinian after the 532 fire which destroyed a large part of the city and of a major restoration in the VIIIth century. In the late XVth century Hagia Irene was included in the Topkapi Sarayi complex. Its rear side stands in the First Courtyard of the palace which was utilized by the Janissaries and the church became their armoury. The high walls surrounding Topkapi Sarayi and some minor Ottoman buildings impair a frontal view of Hagia Irene at close range. Here are several huge porphyry sarcophagi, said to have been brought from the destroyed church of the Apostles and to have contained the bodies of Constantine and some of his successors. Thomas Graham Jackson - Byzantine and Romanesque Architecture - 1913. 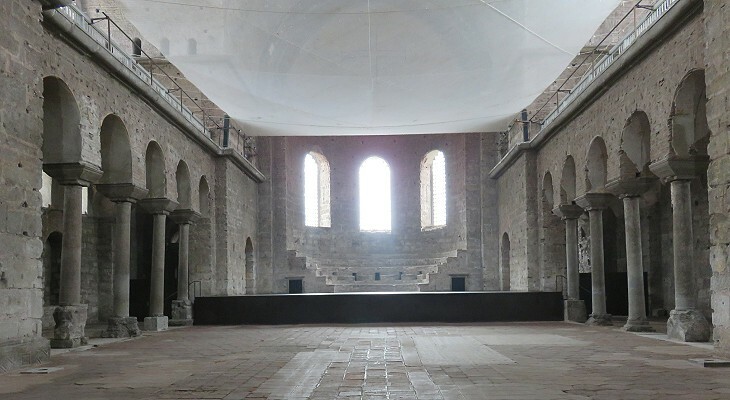 Hagia Irene was accessed from an atrium, a porticoed courtyard which is characteristic of early churches and was reserved to catechumens (Christians preparing for baptism), similar to those at S. Clemente in Rome and at Parenzo in Istria. Five doors allowed the catechumens to watch the ceremonies from the atrium. Most of the sarcophagi Jackson saw have been moved to the Archaeological Museum of Istanbul. It is said to have been injured, if not thrown down, by an earthquake in 740, and to have been restored or rebuilt shortly afterwards, but we probably have in the present building the original plan and scheme of construction of Justinian's time. It is in its form a mixture of the basilican and the domed church. The nave consists of two large bays covered by cupolas, prolonged eastwards by an extra bay for the apse, and surrounded by two lateral aisles, and a third at the west forming a narthex. The result is that on the ground floor we have the plan of a basilican church with nave and aisles, but the upper floor foreshadows the Greek cross of the later churches. 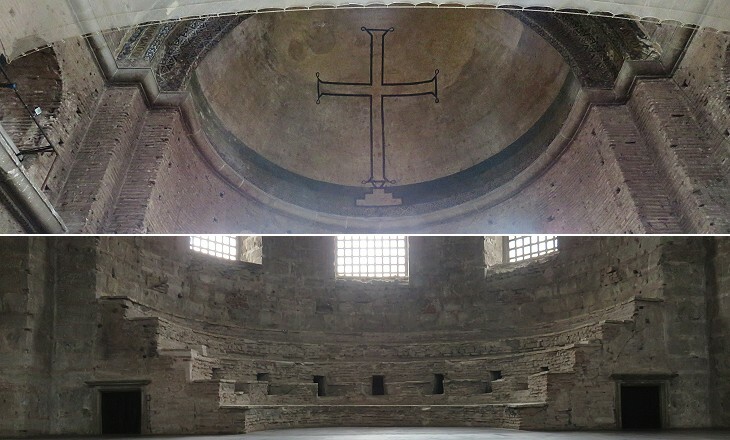 Hagia Irene was restored/rebuilt by Emperor Constantine V who was a very fervent iconoclast, so that the mosaic decoration of the apse was limited to a cross and two (barely visible) lengthy inscriptions from the Book of Amos and Solomon’s Psalms alluding to the House of the Lord. Although what we see is not the "synthronon" of the IVth century we can imagine the bishops who attended the 381 Council sitting on it and debating key theological (and political) issues. The Council was promoted by Emperor Theodosius to restore full compliance with the Nicene Creed in the light of the growing spread of Semi-Arianism, a doctrine which Emperor Constantius II had fostered as a compromise between Arianism and the Nicene Creed. Another objective pursued by Theodosius was to strengthen the importance of the Patriarch of Constantinople. A canon endorsed by the Council stated that he was second only to that of Rome. The purpose of the canon was to improve the standing of the Patriarch of Constantinople versus those of Antioch and Alexandria, but centuries later it was utilized by the Popes to justify their supremacy over all the patriarchs. Considering the large availability of ancient columns at Constantinople, the fact that those utilized to restore Hagia Irene were so ill-chosen is hard to explain and it negatively strikes visitors (especially those who have seen the other church covered in this page). The original floor level of the church was some feet lower than it is today and excavations have been undertaken to show the full height of the building. 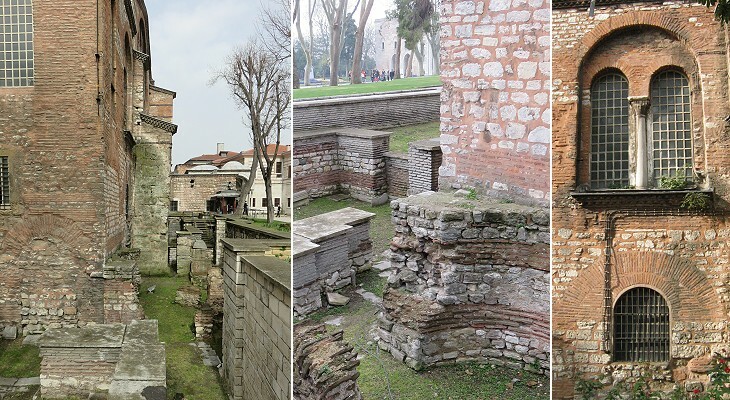 These excavations have brought to light some walls of a hospice built by Samson, a pious man, which, according to written sources, stood between Hagia Irene and Hagia Sophia. The church was called "Small Hagia Sophia" by the Ottomans because of the general belief that it had been built by Emperor Justinian as a test for the construction of Hagia Sophia. 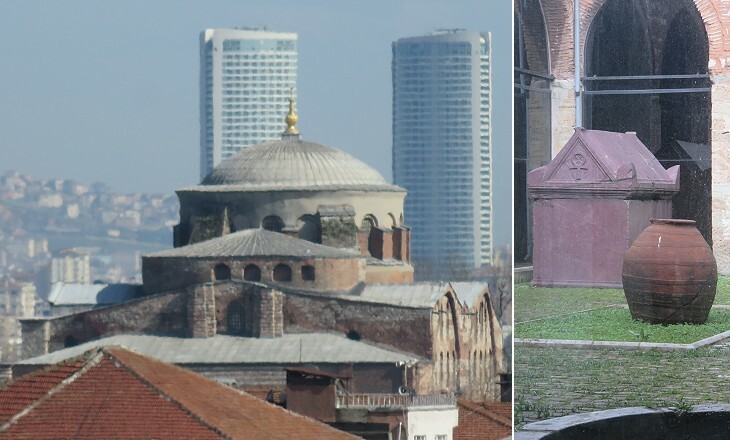 As a matter of fact the design of the two churches is quite different; while today the plan of Hagia Sophia is of difficult perception because of the buttresses which surround it, the plan of this church is pretty evident: a small square basilica with a central dome resting on an octagon. It was dedicated to Sts. Sergius and Bacchus (IVth century Syrian martyrs) because they interceded in favour of Justinian by appearing in a dream before Emperor Justin I, uncle of Justinian. 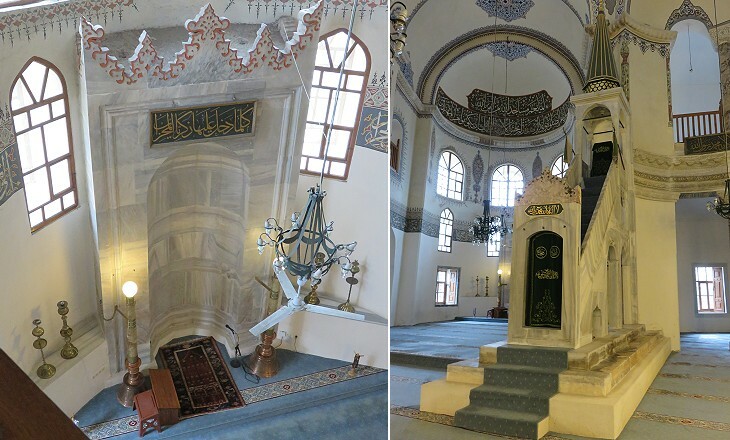 The church was turned into a mosque in ca 1510 by Huseyin Aga, head of the Eunuchs, who built his own mausoleum next to it. After a long period of abandonment and decay the building was thoroughly restored in 2008. It is still used as a mosque. This second church, which has disappeared, was dedicated to Sts. Peter and Paul. This indicates that Justinian was on good terms with the ruling Pope (most likely Pope John II), because the two saints are patrons of the City of Rome. 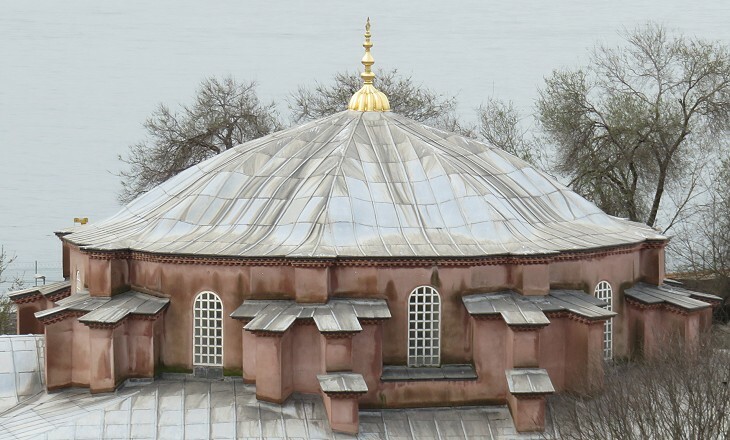 The restoration of Little Hagia Sophia has emphasized its unique design. 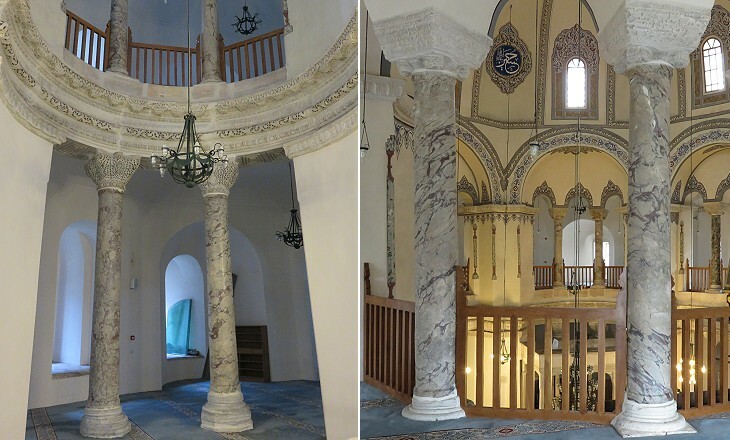 In general it can be said that the architectural aspect of a church gains when it is turned into a mosque because screens, altars, paintings, etc. are removed and the lines of the building become more evident. In a period of wealth Constantinople could rely on a varied supply of marbles which came from quarries in Greece and Asia Minor. The marbles quarried on Proconnesus, an island in the Sea of Marmara, were (and are) widely used. 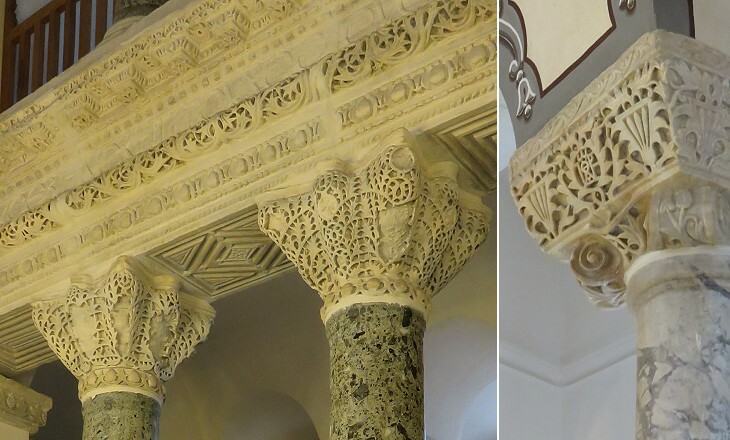 They were so fashionable that they were requested for the columns of S. Apollinare in Classe in Ravenna. At Sts. Sergius and Bacchus pavonazzetto columns, quarried at Synnada near Afyonkarahisar, were used together with vert antique/green porphyry columns from Sparta. 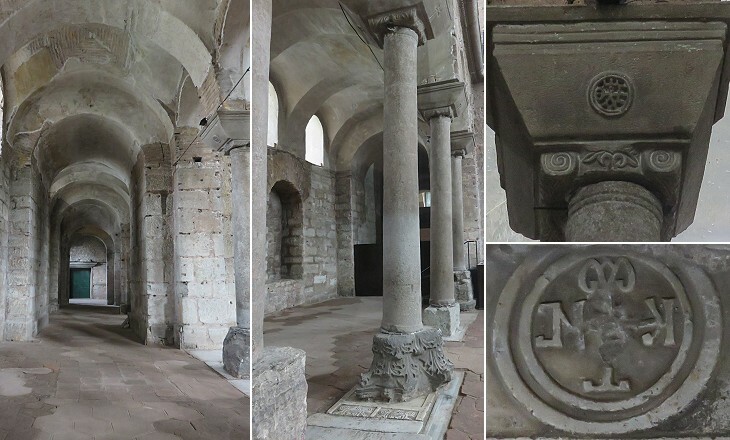 Similar beautiful capitals can be seen at the unfinished Basilica of the Pillars of Philippi. A long dedicatory inscription, carved around the nave in the rich entablature, names the royal patrons (you can see a small detail of it in the image used as background for this page). When the church was turned into a mosque the architect in charge of the change had to deal with the fact that, similar to S. Vitale, the plan of the building did not allow a full view of its interior from all points. 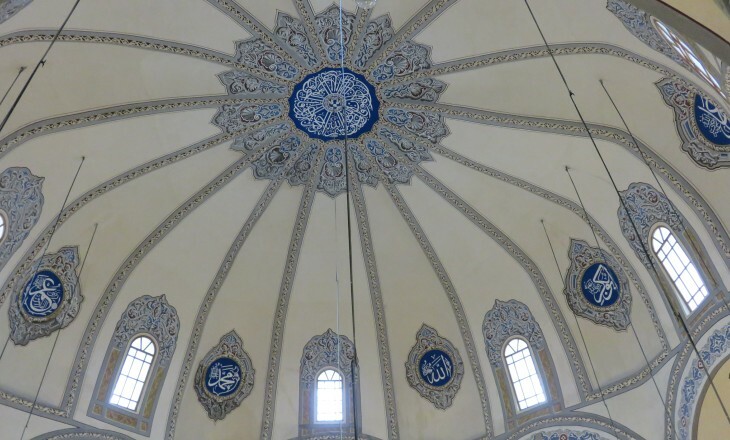 For this reason the minbar was not placed in its usual location, next to the mihrab, but in a central position within the octagon supporting the dome.